Non-plussed by Titanfall? Couldn't give a flying fiddlestick about GTA V? 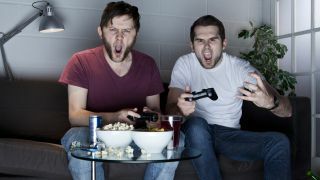 Well, don't worry as a new modified game controller has been developed that could take the boredom out of games by upping the ante when your attention level starts to deplete. Designed by researchers at Stanford, the emotion-sensing game controller comprises an Xbox 360 remote and a 3D-printed sensor module that measures a gamer's vital statistics - such as heart rate, blood pressure and reactions. The idea, according to Corey McCall at Stanford, is that future games be able to use this data to modify a game to perk a player up if they are feeling a little non-plussed. "If a player wants maximum engagement and excitement, we can measure when they are getting bored and, for example, introduce more zombies into the level," he said. Ah, zombies. The ultimate boredom buster.